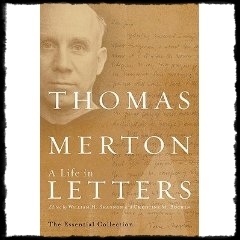 Patrick O’Connell over at The Merton Seasonal asked me to review Thomas Merton: A Life in Letters for the Spring 2009 magazine. It was a great chance to exchange emails with two of the great Merton scholars and editors of Merton’s letters Bill Shannon and Christine Bochen. I was particularly interested in looking at the “American-ness” of Merton’s correspondence. Aside from the theological or spiritual content, I wondered how Merton’s letters fit in the genre of American literature. While it is necessary to place the letters in this collection in the context of Merton’s own life and in the context of Merton’s overall legacy, it is also important to examine Merton’s letter-writing art in the context of 20th-century American literature. Literary sociologists David Barton and Nigel Hall argue in Letter Writing as a Social Practice that letter writing is a genre unto itself and deserves to be studied as enthusiastically as poetry or the novel. Additionally, they posit that “many contemporary genres have their origins in letters” (Barton and Hall, 4). The new research into letter writing raises several questions regarding Thomas Merton, who was, as Shannon and Bochen put it, “one of the most prolific and provocative letter writers of the twentieth century” (vii). How will Merton be critiqued as a letter-writer per se? William Shannon said in the same personal e-mail that “Merton was an amazingly good letter-writer.” How will critics analyze Merton’s letter-writing genius as compared to his innovation and skill as a poet or his daring analysis as an essayist? British novelist, satirist, and literary critic Evelyn Waugh, who prepared the manuscript of Merton’s The Seven Storey Mountain for a British audience, so much admired Merton’s skill that he advised Merton to “put books aside and write serious letters and to make an art of it” (ix). Of course, Merton didn’t set book-writing aside, but he did continue over his life to perfect his letter-writing craft. More importantly, are Merton’s letters derivative of his political essays, theological and monastic treatises, autobiographical writings, poetry, and intellectual critiques or, as Barton and Hall prompt, do all these genres have their genesis in Merton’s letters instead? Often the personal correspondence of a well-known personality are collected and published in order to provide enthusiasts with an “inside look” at the “personal” life that would otherwise be hidden. The publication of personal letters can have a tinge of voyeurism. I would argue that it is in Merton’s letters that we find the foundations of his published works. The letters show him testing ideas, crafting opinions, grounding his analysis, playing with images and phrasing, sorting and sifting the essential components of his life story. From this perspective, Merton’s letters (and journals) are the seedbed for his completed works in other genres, rather than the frosting on his “real” work.